When it comes to sunglasses, there are so many choices that it is difficult to know which are the best for your eyes. 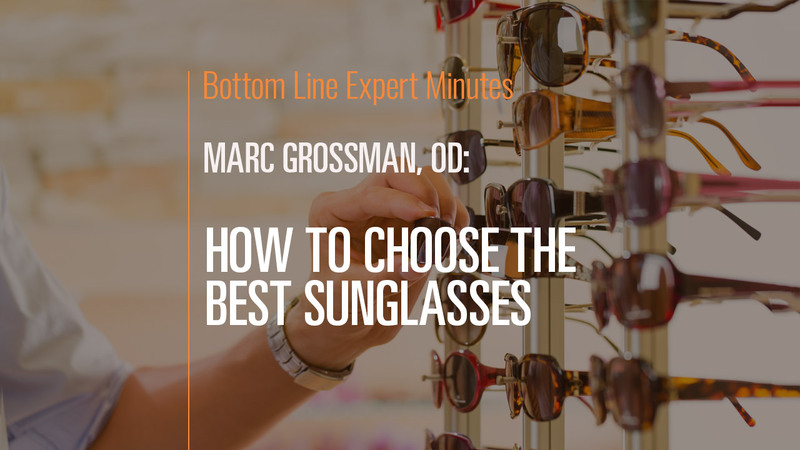 In this video, Dr. Marc Grossman, OD, LAc, holistic developmental/behavioral optometrist and licensed acupuncturist, discusses what to look for in a pair of sunglasses. Sunglass lenses should be either brown and amber or gray. Brown and amber lenses offer the most protection against ultraviolet (UV) light, while gray lenses offer a neutral tint which does not greatly affect color perception. Polarized lenses are good, particularly for people out in snow or on the water. Dr. Grossman does not recommend transition lenses (which lighten or darken depending upon the ambient lighting) because while they work fine outdoors, they do not work well while driving in an enclosed vehicle. Finally, sunglasses should be worn year round, and should wrap around the sides and top of the eyes as much as possible. Combining sunglasses with a hat with a brim will offer eyes the most protection against the sun.